One of our early initiations into Tasmanian life was at the mercy of the buzzies. These pretty little plants look like fireworks on a stem, the fresh ones a tempting aura of pink around a green head. They're so pretty, our girls initially collected them and presented them to me as bouquets! But don’t let the beauty fool you. Buzzies are greedy, implacable, sock-grabbing, towel-riding, hair-raising hitch-hikers that leave you sitting for hours picking them out. 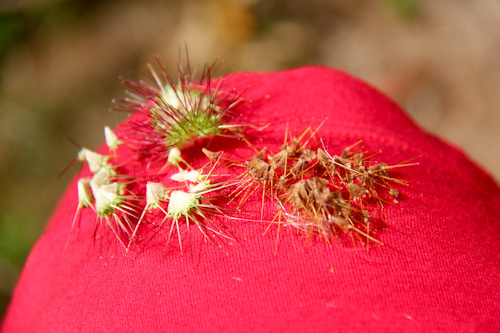 As the seed-head ages, it changes from green/magenta to brown. A little rub against something fibrous, and the buzzies open up and grab on. And that is why I shouldn't wear my crocheted shoes in this state! If you’ve visited Tasmania, surely you’ve encountered buzzies too. Little details like this remind us that we’re in a special place — different from the mainland — and for that, I treasure the memory of these plants … as long as they stay out of the bus! I haven’t encountered buzzies in Tasmania before, most likely as I’ve only been there before in the middle of winter! 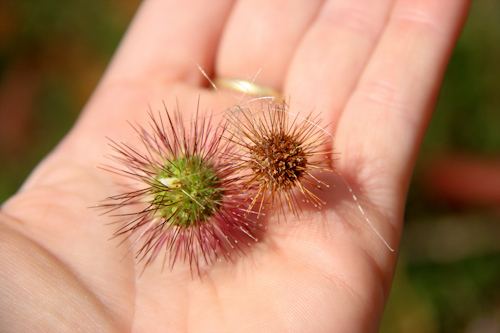 Remind me of burrs, if that’s what they’re really called, which are less spiky but annoying nonetheless. Agree that Tassie is a magical place, one I want to visit in the summer too! You don’t have them in QLD? They are in SA, and Vic, too, I think. Did you read that book? What did you think? Just checked – I’m not crazy, they’re in every state, plus NZ. 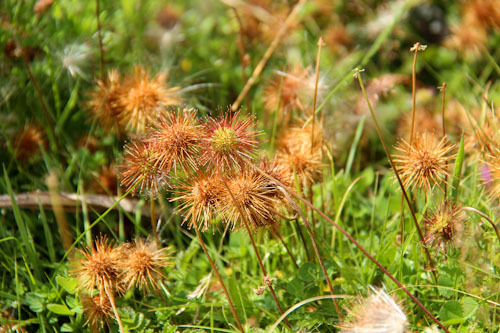 Real name is Acaena nova-zealandiae. Hah! We used to call them ‘Bidgee Widgees’ when I was a kid (Victoria) and as you say, they’re the worst buggers in the world for extricating from socks before going in the wash. I think my mum gave up in the end and figured that if the needles were annoying us, we’d pull them out ourselves.